I bought a Chas Roberts white spider online, a classic Roberts white spider in 753/ “service de corse “. 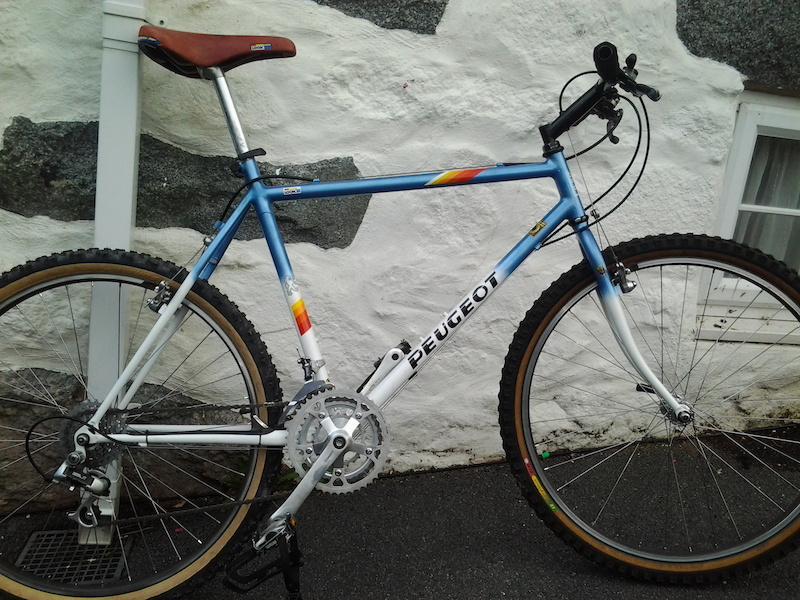 Awesome frame similar of that used by Tim Gould and the Peugeot mount bike team in 1988-1990 (which I own the original :¬)). However as is prone with 20 year old micro thin 753 there are a few problems. When I got it and stripped the paint found it had a crack in the Bottom bracket, A crack in the seat tube and down tube. These had been badly repaired and were too old and rusty to repair. So do I send it away for a £400-500 bill? Write it off? Nah let’s have a crack rebuilding her, nothing to lose. Although with how much I have to cut out and lose I think it will be a Replica Roberts by the time I finish! 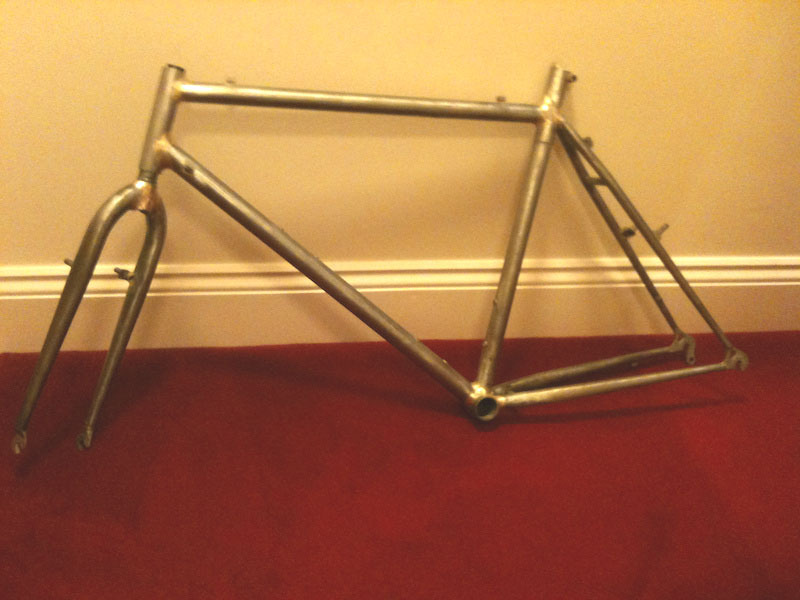 Here is what the frame looks like after is been stripped. Crack in the bb shell, and the seat tube at the bb and further up. 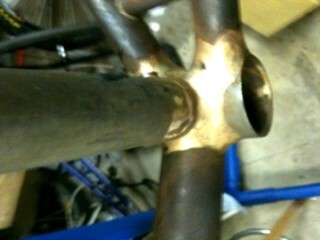 After stripping the frame I spotted some additional Braze on the seat tube. On closer inspection there are a crack in the lower part filled with silver solder and further up a crack that has been filled with brass and over cooked with holes. Not fixable. I think we may have to do some major surgery on this. Before I start I need to measure all the angle and features and make a full size drawing to work from. 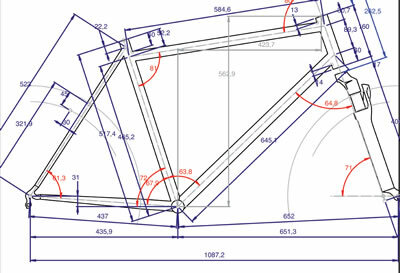 Looking a the quality of workmanship and features of the frame its a little daunting. There is a reason Chas Roberts is a master frame builder, and I hope I can come close to the finished product that he does. even if it takes me a stack more hours. Straight blade 1″ forks are going to be hard to come by. So I will either fillets over some tig ones for effect or make some from scratch. Starting with the down tube head tube join as always. I have made the first mitre. Making sure its is a close as it can be, no daylight or gaps of any kind. I have gone for a Columbus nivacrom downtube and a reynolds 531 headtube. I have tacked using a SIF 101 1.5 mm rod. 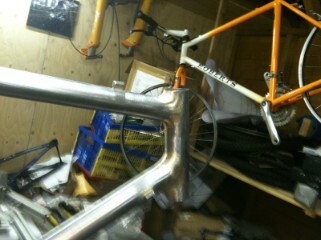 With the head tube I have to try and match the fillet radius as per the original frame. You can see the seat tube with re-enforcement tube in the background that will have to be cut to shape then silver soldered as the gap is too small for brass. 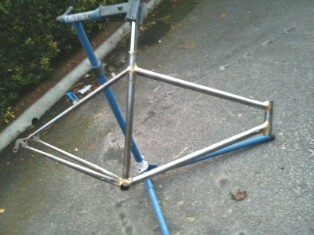 Next I have done the main triangle with 531, Columbus Nivachrom tubes, a Silva chromo bottom bracket shell. 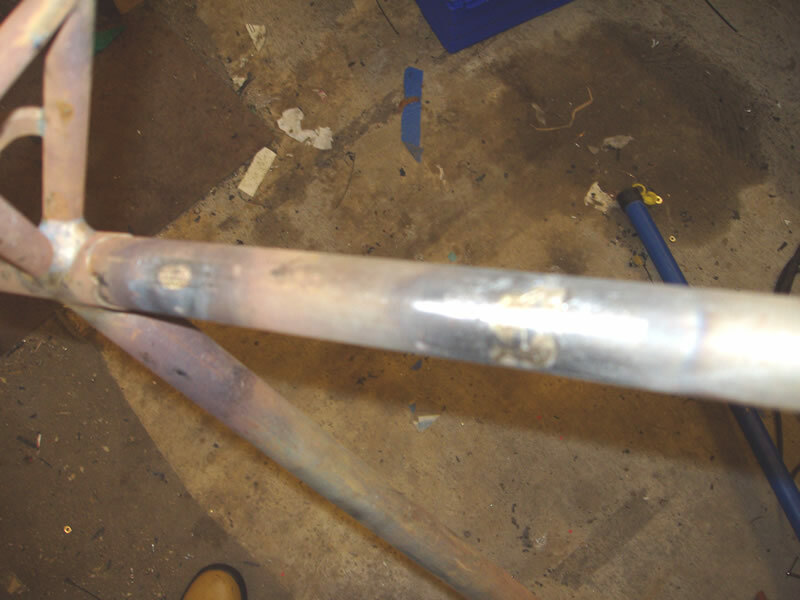 All filleted brazed in brass (sif 101). I have tried to match the Roberts fillets as best I can. Now for some major clean up before the back end starts. After the rear triangle is cleaned up I put it all to a jig to tack the rear end. thankfully the Roberts mitres were spot on and only needed a clean up. A few tacks then some small fillets and ta da, a whole frame. I had to do a small repair to chain stay as it had some corrosion but all in all in great shape now. Right now stored in the Airing cupboard until the paint turns up. I got a chromo straight spinner fork and put some fillets down so it matches the look. Actually its probably nearly as fast to build a new fork! So the paint has come. I got it from a specialist place. 2 Pack base/primer then white, then pearl red and mettalic blue. the fades are not quite as good as i wanted but its pretty good. Black would have been best to cover any welds that were not perfect as the metallic takes no prisoners. but it looks good. Paint was left to cure fro 5 days in the airing cupboard just to make sure. 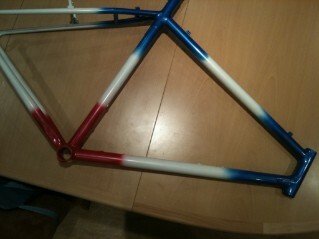 then custom Peugeot decals and Roberts decals and look to finish it off. Oh and some “Service de corse”/ 753 Reynolds tubing decals. Just need a clear coat and a full 1990 Campagnolo group set. Clear coat done and cured. So its time to ream the head tube and bottom bracket. then build the bike. The headset has a bigger stack than I had planned for so the top head tube ream goes to the bronz should not cause any problems. the headset just fits without the spacer and some thread lock. The bottom bracket on this is a 73mm shell but the bottom bracket I have is a 68 so a new axel is needed (non Campag for now). 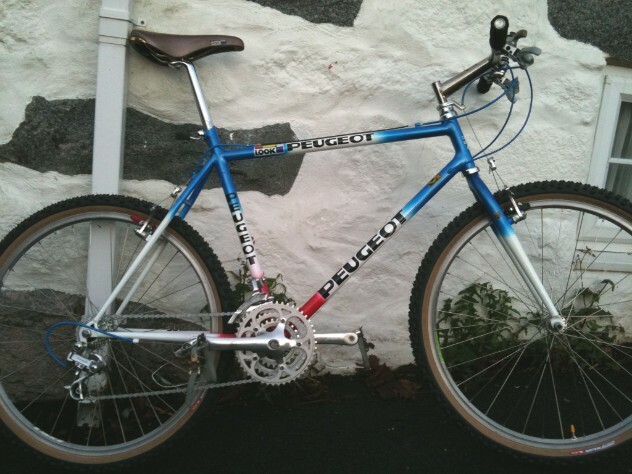 I have gone for blue cables as they look good but I do have the official Campag pearl ones. Ritchey amber wall mega bites. And a hard to find look saddle. The Chainset is a NOS centaur one and a new chain the rest of the kit is used but in great condition. 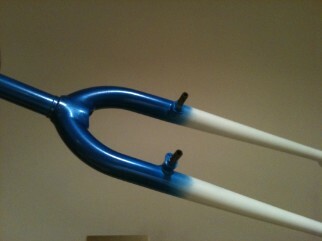 I have a black chromo stem and 501 bars but they need a paint before they go on. Apart from that it’s looking good.